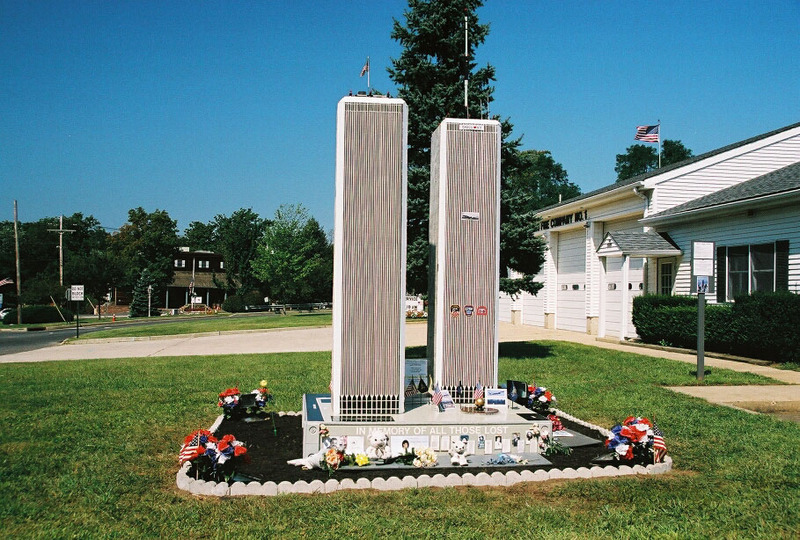 On Dec. 14, 2001, Tinton Falls residents awoke to find a scale model memorial to the World Trade Center towers had been installed on the front lawn of Tinton Falls Fire Co. #1. The original memorial, complete with over 40,000 hand-drilled, back-lit “windows,” would light up at night, with the roof top Radio/TV antenna lights flashing in sequence with the roof lights on both towers. It was hand-built over 93 days after the 9-11 attacks by Station 1’s Ex-Chief, Jared Stevens, and was made from wood, luan board, internal wiring and spotlights, taking over 900 hours to construct and install. It was stunning in its authenticity and detail and it was all built by Chief Stevens himself. The memorial instantly became an icon, a central meeting point for people, and it appeared in the New York Times, Time Magazine, and numerous other media outlets across the US and overseas. Photos of it are on display at memorial sites in New York City, Washington DC, and Philadelphia. Weather took its toll on the wood-based memorial, and on New Year’s Eve 2008, a storm brought down the Towers, one and then the other, in an eerie similarity to the tragedy it memorialized. Members of the fire company erected temporary white columns and action was taken to replace the first memorial with steel from the World T rade Center towers themselves. 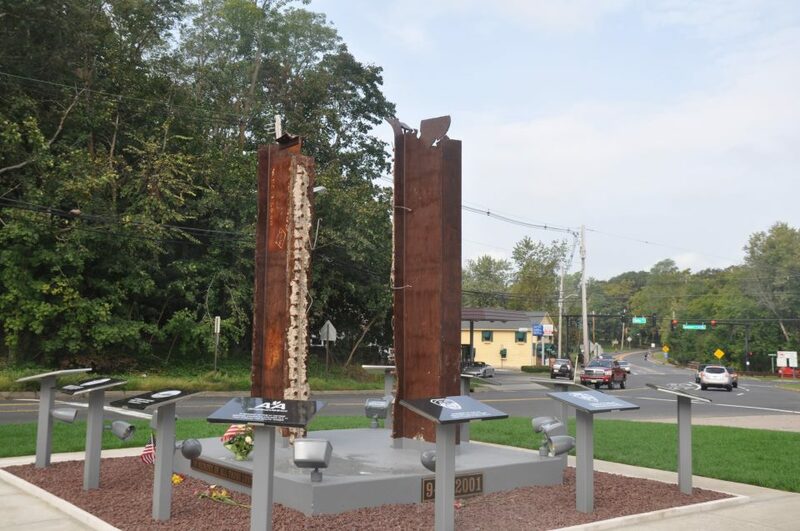 A team led by Jared Stevens, Greg Wagner, Steve Park, and Brendan Tobin worked to get the steel donated from the Port Authority and to raise funds and procure the materials needed to build the new memorial. After months of fund raising and other activities, the beams were on site at the fire house and ground was broken to build the new monument. 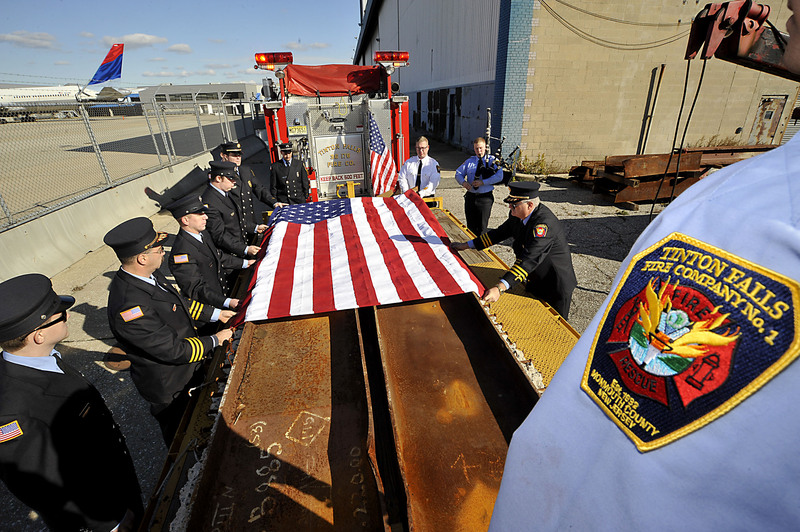 Several months of daily work by an average of 20 firefighters per day resulted in the new WTC memorial that stands on site. It was dedicated on September 11th, 2011 in a 10th anniversary ceremony. It has 10 plaques to remember those on the flights and in the Towers and the Pentagon who lost their lives that day and one plaque memorializes the original Jared Stevens towers memorial. The towers are affixed to a steel base and are surrounded by tons of heavy-duty concrete. It remains one of the few memorials anywhere with an open access area for visitors to be able to walk up and touch the beams, allowing people to make a physical connection to a very powerful, very personal event. It is our pleasure to share it with everyone. Annual 9-11 memorial services are held on site and all are welcome to visit any time.